Jim Simpson is the recently named CEO of ABS and he possesses more than 37 years of experience in the space and defense business, including 15 years of SATCOM experience with expertise in sales, marketing, strategy, business development and program management. They transport 90 percent of the world’s trade: everything from oil to smartphones, toaster ovens to automobiles — yet, there are only about four million of them, out of the world’s seven billion and the chances are, you have never even met one. Great moves are afoot in Australia — the Defence market for the first time in many years is optimistic and expansive, undergoing a massive rebuild of industry capability; the establishment of an Australian Space Agency has recently been announced; and the economy has continued its growth for a record-breaking period edging close to nearly three decades. These augur well for more Firsts. Mobile network operators (MNOs) are rethinking their cellular backhaul strategies to meet a new set of performance and cost requirements. As mobile networks evolve, MNOs need to adapt their backhaul solutions to handle increased data usage and expand service availability. 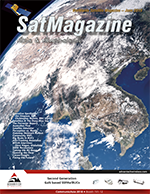 This AsiaSat article presents some concepts on the VHTS gateway rollout scheme. The practical implementation of these concepts may be tied to specific satellite payload designs and the available space-ground segments control management system features. According to the latest Internet World stats (www.internetworldstats.com/), more than four billion people are now online, representing more than half of the world’s population — yet, there remains a huge disparity in penetration between the well-served developed regions, which are approaching 100 percent, and the billions of people living in rural and even ex-urban areas with limited or no access to broadband internet. If there is a single theme that has driven growth in the satellite industry over the past several years, it would be mobility. Christopher Richins is the co-founder and CEO of RBC Signals, a multi-national company providing flexible global communications services to commercial satellite operators. The Globalstar team is running full throttle and we will launch at least 4 new products by the end of 2018. We have command of our cost structure, we’re focused on our mission and, as you can see from our operating results, we are delivering on our promises. Over many decades, satellite technology has provided a reliable and efficient platform for the communication of full motion video (FMV), audio and data. However, more recently, there have been discussions surrounding the impact of IP-based systems and how these new architectures could compete with and ultimately replace satellite communications. There is a hungry beast lurking in the shadows of the mobile telecommunications market — network engineers are starting to realize that the good old ways of taming this beast are losing their power. Tchoukball is a niche sport that was created in the 1970s by a Swiss biologist — every year, the Fédération Internationale de Tchoukball, the sport’s highest governing body, helps organize regional and world championship matches; teams from the Ivory Coast to Argentina and China battle it out for the top podium spot. For employers looking to outsource their recruiting for the first time, this guide compares the primary types of services — Retained Executive Search, Contingency Search and RPO. Change is in the air across the world — 5G is set to revolutionize our lives and Over-The-Top (OTT) broadcasting is entering a golden age. With billions of connected devices set to burst onto the scene and into people’s hands, network boundaries will be pushed further than ever before to enable new types of applications and services across almost every industry and market growth is only set to increase.